The word "loss" contains only four letters, but its size belies the amount of fear it produces at even its mere mention. Even more terrifying and enormous is the reality of loss—specifically, the loss of a spouse. For the loved one left behind, the loss of a spouse or partner is frightening, and the ensuing grief can be all-consuming. Regardless of the circumstances, spousal loss devastates on numerous levels and in countless ways. Whether the loss is brand new or decades old, it nonetheless leaves indelible wounds. Worst of all, widowhood has the capacity to keep those affected from moving forward into a new and fulfilling life. The need for relatable and actionable direction and advice remains a very real need for the widowed community. In Loss is a Four-Letter Word, award-winning author Carole Brody Fleet, who herself experienced the numbing pain and grief as a young widow and mother, shows readers a way out, a way to move forward—not "get over"—their most profound loss in positive ways. Fleet combines no-nonsense, directed advice with specific, boot camp style "assignments" that are framed with compassion and humor. Appropriate for both the newly bereaved as well as those who may have been grieving for years, Loss is a Four-Letter Word is also ideal for those who wish to best support the bereaved through a most challenging life-journey. Do you right now feel stuck in a place of loss? Do you feel as though you have at all begun your healing journey in earnest? Do you feel as though the way you feel right now, today, is the way that you will feel forever? Do you not know how to answer any of these questions? Welcome to Lesson One of Bereavement Boot Camp. Did I just scare you? Relax. Let me first reassure you that Bereavement Boot Camp does not include barking drill sergeants and twenty-mile hikes. What it does involve is you getting serious with and about you and your healing. It involves you committing to you that you are going to do one tiny thing every single day to move yourself out of a place of pain and move forward toward a place of peace. Did you note the repeated emphases on the words, 'you' and 'your'? There is a really good reason for that emphasis: you may have not put any real emphasis on yourself for a very long time. Guess what? The time to put yourself at the top of your own to-do list has just arrived. Getting serious with yourself and choosing to either begin or move forward on a healing journey sounds pretty obvious, doesn't it? Perhaps—but it might surprise you to learn just how many people choose against either starting or continuing forward from a place of grief to a place of peace. While there is certainly no argument that grieving your loss is essential, so too is healing . . . and your healing process begins (or continues) right now. Each Boot Camp chapter is based upon an affirmation borne of my own loss experience. These chapters and affirmations are specifically designed to help you move through whatever obstacles might be holding you back from reaching the destiny that you choose to design and that you deserve. Take each affirmation (or EKITA) and put it in a place where you will see it every day, the more often the better. Start your day and end your day with an affirmation or an EKITA. Why? It's a very simple bereavement recovery math equation: Affirmation equals reinforcement; reinforcement creates belief; belief creates proactivity, and proactivity is the foundation of healing. You may be thinking to yourself, So, Carole, I go through the Boot Camp and read all of the other chapters and EKITAs and immerse myself in affirmations and complete all of the Boot Camp assignments. Does that mean that by the end of the book, the grief and pain will be totally gone? Of course not. I personally get pretty riled up when I see other grief recovery books (or programs, CDs, webinars, seminars, and the like) make claims like 'Feel Better in No Time' or 'Grief Be Gone in X Amount of Days.' Claims such as these are akin to ads that attempt to entice us with 'Lose Forty Pounds in Thirty Days.' It is not only false advertising, it is both an impossible and unattainable goal—and when you do not feel better within the promised amount of time, you feel even worse for failing to attain the unattainable. My core belief has always been that no one can guarantee emotional healing of any kind within any set period of time (especially if the word time is immediately preceded by the word no). However, I can get you moving in a forward-focused direction by the end of this book—and isn't forward-focused the direction in which we all want to be heading? One note of caution: the talk will get tough along the way, and there is an excellent rationale behind tough talking. Years ago, a fantastic mentor of mine once said, 'I can be good to you or I can be good for you.' I choose to be good for you, which occasionally entails taking off the velvet gloves and talking the tough talk (which is code for being honest). The good news is that my honesty is coming from a place of compassion, understanding, and most importantly, from someone who has walked a path similar to yours. What I do not want to see is anyone becoming comfortable in a place of grief, sorrow, emptiness, or despair. I do not want anyone thinking, I guess this widowhood thing is it for me, and thereafter choosing to settle for . . . well, settling. Too many widowed who are grieving their loss or who are suffering through challenges along their healing journey will choose to settle simply because (a) they don't know how to take the first steps forward, (b) they were doing fine for a while and then something or someone hung them up to the point where they now feel 'stuck,' or (c) they are listening to the wrong people, those with negative opinions who are exerting way too much influence that generally yield counterproductive results. Frankly, you may have found yourself in a very sad sort of comfort zone—and if making that current comfort zone of sorrow just a little uncomfortable is what it takes to get you moving forward, I am more than happy to do so. Following is your very first Boot Camp Affirmation to copy, stick to your bathroom mirror, paste to your forehead, or otherwise keep in front of you as much as possible. I'm still here. Although I face the daily challenge that is widowhood, it's because I am still here that makes me automatically entitled to the life that I truly want to live, in the ways that I wish to live it. I will not feel guilty in pursuing complete healing. I will not question my right to present and future happiness (however that happiness manifests), nor will I permit anyone else to question that right. Going forward, I will live with the determination that settling for less than the life that I choose to design for myself will never be an option. The reason that you picked up this book is simple: you do not wish to postpone your healing journey any longer. As with most who are grieving, you may have had little or no control over the circumstances of your loss—but you have control now. Decide right now to truly feel the entitlement that this affirmation is giving to you. Breathe it deeply in. Let it into your heart. Believe it. Own your healing journey. Own this thing called life. Wake up every day with this intention and this sense of entitlement, and let no one take either away from you. Now is the time. Today is the day. ©2018 Carole Brody Fleet. All rights reserved. 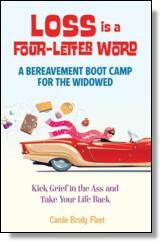 Reprinted from Loss is a Four-Letter Word: A Breavement Boot Camp for the Widowed. No part of this publication may be reproduced, stored in a retrieval system or transmitted in any form or by any means, without the written permission of the publisher. Publisher: Health Communications, Inc., 3201 SW 15th Street, Deerfield Beach, FL 33442.